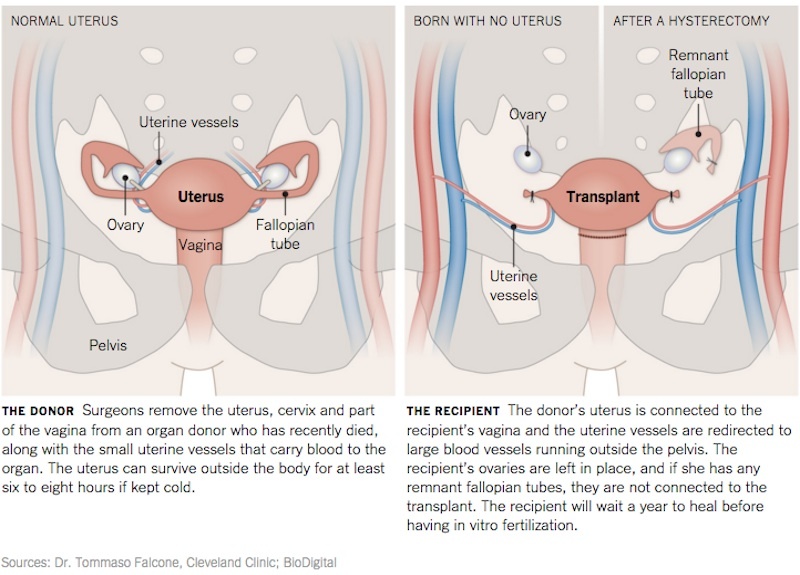 A transplant of the uterus involves a five-hours-long surgery, financial stress, a year afterward spent waiting and anticipating, followed by a round of attempts at in vitro fertilization, and an extended course of anti-rejection drugs. But for women born without a uterus or who had to have their uterus removed, this revolutionary type of transplant represents a previously nonexistent opportunity for them to carry and birth a biological child. Just three months ago, we told you about a Swedish doctor who performed the first womb transplant that lead to a live birth. Now uterus transplants will likely become available in the United States in the very near future. For the 50,000 women in the United States who could be candidates for the transplant, the surgery team at the Cleveland Clinic may be the answer to their reproductive prayers. Eight women are currently candidates for the complicated process and procedure, with the hopes that a successful operation will occur within the next few months. Uterine transplants are in a unique category of their own in the medical world since they aren’t a life-saving measure as kidney or heart transplants are. While the Swedish team takes the donor uterus from a live donor (often the mother of the transplant recipient! ), the U.S. team will take it from a donor who has died, making the removal surgery shorter and safer. After the recipient surgery, patients must wait a year before trying to get pregnant through IVF. The patients will be closely watched throughout the resulting pregnancies for high risk complications, and their babies will be born via C-section to reduce any strain on the uterus during labor and delivery. 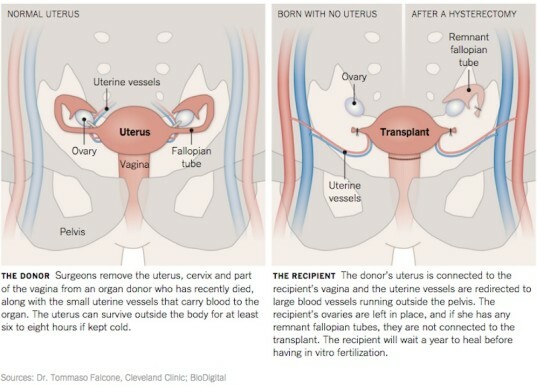 The temporary uterus will be removed after one or two births, so that the donor recipient no longer has need for anti-rejection drugs. If the onerous process seems daunting, it isn’t discouraging numerous women from applying to be among the first to undergo the transplant in the U.S., nor is it dissuading other hospitals and medical teams from making uterine transplants one of their reproductive surgical options. Other hospitals in the U.S. and in Britain, hope to perform these procedures in the near future, giving women without a uterus the hope of experiencing pregnancy.